in case you haven't noticed I love to paint my nails, it's a teeny (alright huge) obsession of mine. sometimes my nails can't cope with the constant removing and re painting regime I put them through and get into a rather flaky and damaged state! when this happens I love to give them a bit of TLC. I cut, file, buff and moisturise the living daylights out of them and give them a coat of two of clear strengthening polish. then I paint over them once again aha! It's a very simple manicure, I used one of my favourite models own polishes utopia which is a gorgeous pale pink with a hint of lilac. once this is dry I shake out some assorted glitters and mix them together, paint half of your nail with clear polish and then use a sponge to dab on the glitter. 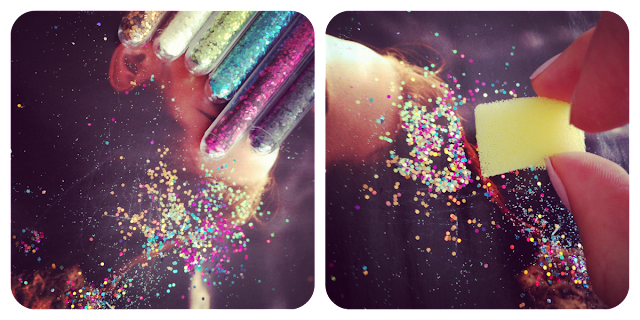 the sponge works well as it gives a random application of the glitter which looks more blended. finish off with a few coats of clear polish to seal everything and it should last for days! where do you get your glitter from?? really want to try this?? 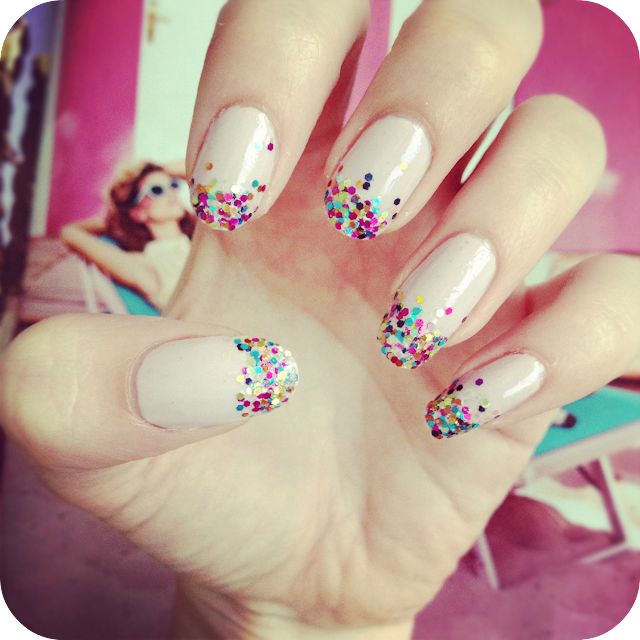 I used to do something like this when I had longer nails, alas they are quite short at the moment. OMG, I'm loving this nail art so much! And I think your outfits are amazing! I think they would be perfect for the Fashion Muse competition of my online fashion magazine, it means that if you enter the contest you could win the chance to have your outfits published there!....we're also looking for nails and make up collaboration, are you interested in it? write an e-mail at info.forerunners@libero.it to learn more! I love that! you always do such a great job! Please check my Blog in case you have the time. I love these - definitely going to try it although mine will be nowhere near as neat!